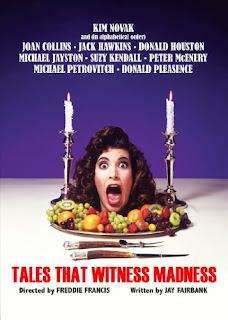 A long-derided, but highly enjoyable, facsimile of the Amicus horror anthology format, directed by the man who made their biggest hits. The framing story apes ASYLUM, as Jack Hawkins arrives at a hi-tech (for 1973) psychiatric facility and learns four patient case studies from. The four stories that follow vary in quality, but the opener, “Mr Tiger” offers a unique contribution to the revolt-of-nature sub-genre, as obnoxious, ignorant humans fall prey to young Russell Lewis’ loyal, invisible pet tiger. Dismissed as a figment of his imagination by his appalling, bickering middle class parents, Mr Tiger ravages them to death while Lewis bangs out a child-friendly tune on his keyboard. “Penny Farthing” is a slight but fun tale of a bicycle acquired by antique dealer Peter McEnery and his girlfriend (Suzy Kendall) that sends them back to Victorian times. It’s punctuated by agreeably melodramatic performances and survives the absurdity of its climax, in which McEnery peddles furtively while his shop goes up in flames. The most astonishing episode is “Mel”, another truly odd variant on the eco-horror theme, with Michael Jayston cast as a literal “tree-hugger”, a married man who becomes rather too keen on a tree he discovers in the woods with the name “Mel” carved on its trunk. The increasingly comical jealousy that ensues between his neglected wife (Joan Collins) and “Mel” – who starts mischievously shedding right after Collins has done the hoovering – is wonderfully played, and the whole story offers a witty, subversive spoof of typical soap opera domestic love triangles. In retrospect, it is also notable for a hallucinatory pre-EVIL DEAD sequence of Collins assaulted by the nearby forest, her clothes ripped and muddied and breasts bared as the camera takes on similar angles to those from the Raimi film years later. “Mel” is so much fun that the final episode, “Luau” inevitably feels like an anti-climax – a pedestrian tale of erstwhile DR WHO assistant Mary Tamm groomed as a sacrificial virgin by handsome US writer Michael Petrovich. Tamm looks great in a bikini and Petrovich likewise in his pants, but the most horrifying aspect of the story is literary agent Kim Novak’s gruesome bright green outfit in one scene – made more disturbing by the suggestive fashion in which she is holding some pineapples.